A rosé inspired brunch with my best girl friends! 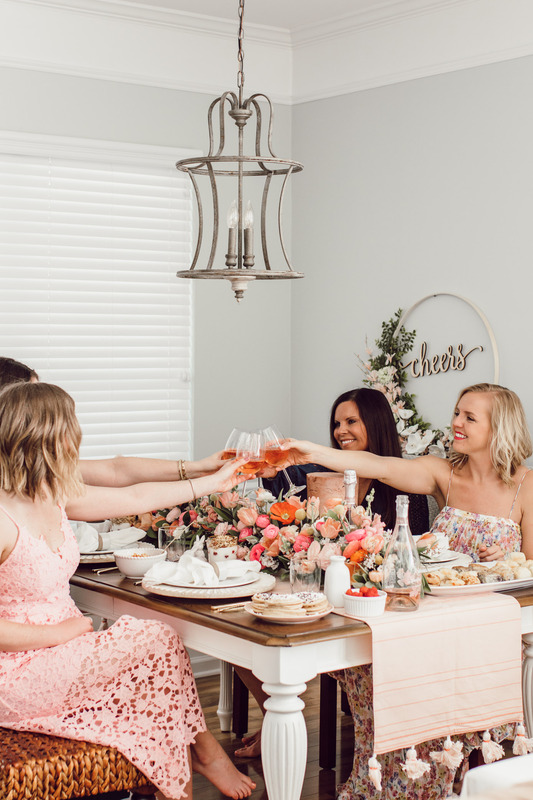 Grab inspiration to throw your own pink spring brunch for Easter or to celebrate the season with girl friends! Y’all I literally cannot tell you how giddy I am over today’s post. My best gal pals and I worked on this tablescape/event for over a month. Organizing every last detail! We all had been dying to put together an event like this where we could create beautiful content for y’all and also enjoy time together. We could not be any happier with how it all turned out! 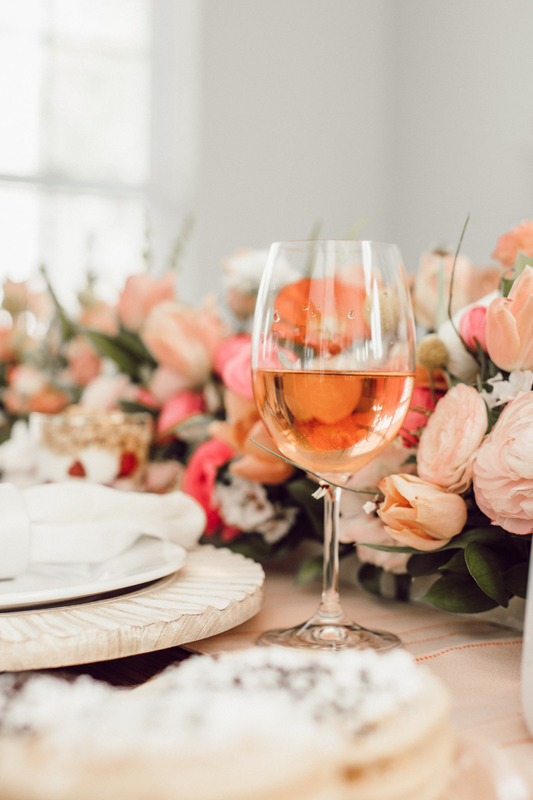 Or more excited to share it with you as inspiration for a rosé inspired pink spring brunch or inspiration for your Easter tablescape. 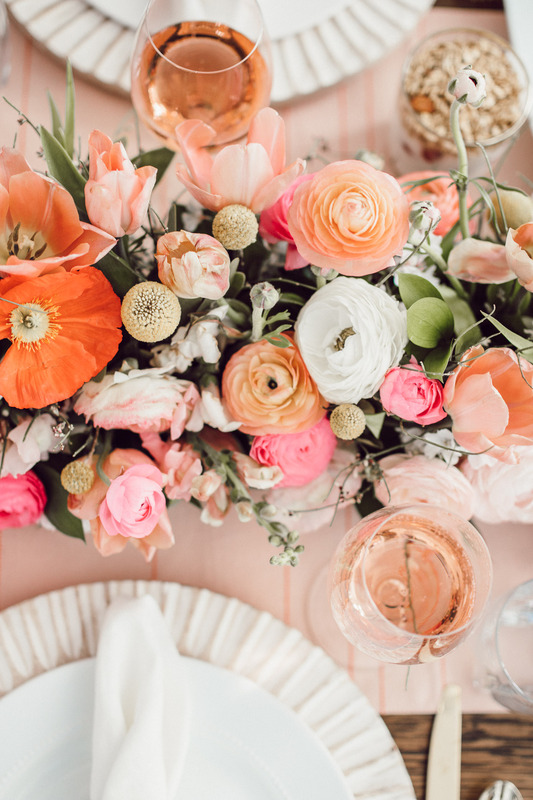 With spring comes pretty pastels, all of the flowers, and rosé. Those are the three things we created this tablescape around. With rosé pink being our main color. Which came from the beautiful Risata Sparkling Rosé. Otherwise, we kept things pretty simple with white dishes + napkins, clear glassware, and natural chargers. Which really allowed the pink to pop and the flowers to take centerstage. 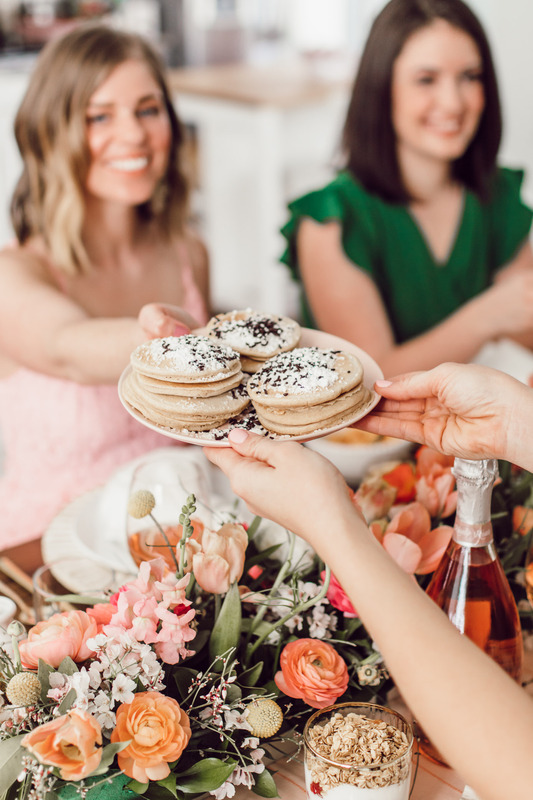 Keep reading for my thoughts on creating the perfect spring/Easter brunch menu, setting the scene, and attire. But before that, let me introduce you to the gals! As mentioned above, one of the main elements of our tablescape were the flowers. 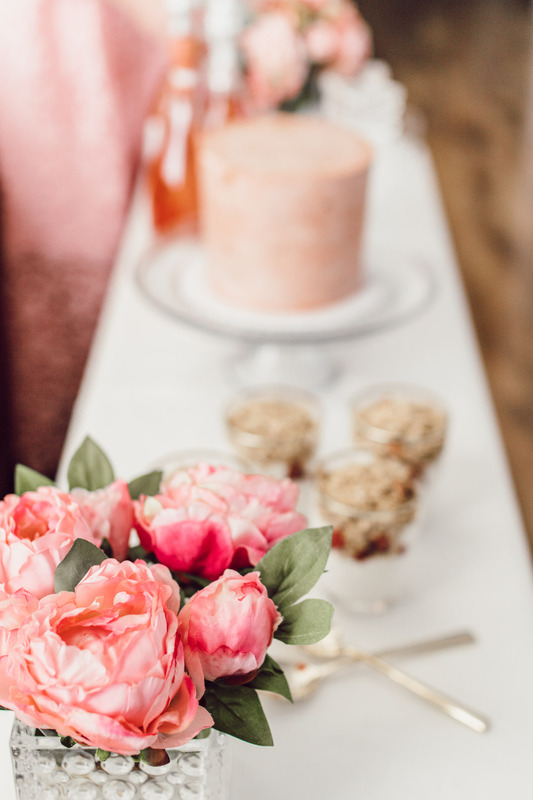 Which should almost always be the case when it comes to creating a tablescape! Flowers make such a statement and help to really fill the table. 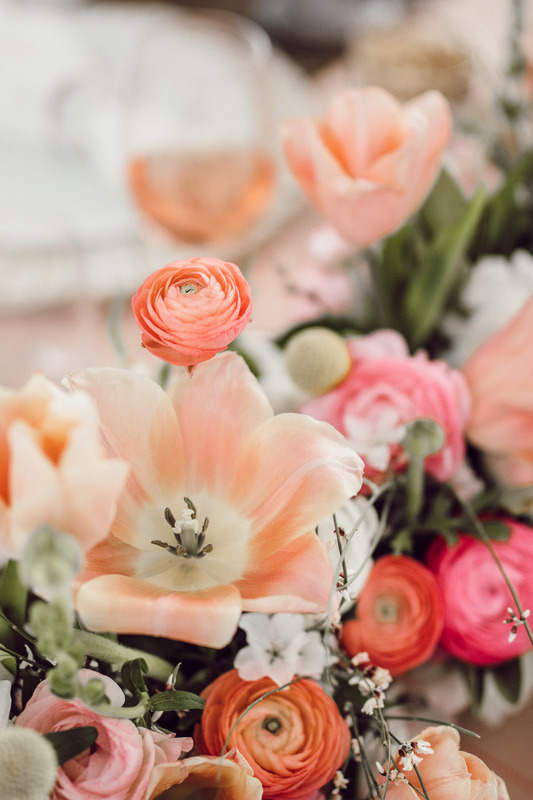 We worked with La Petit Bloom to create our centerpiece and y’all they went above and beyond! I mean, can we all just take a moment to admire how beautiful that row of flowers is? The colors and mix of flowers screams spring! While also perfectly aligning with our color scheme. My recommendation is to fill your table with flowers. Whether you opt for a row of them as Le Petit Bloom created or multiple vases throwout your table. If you want to use fewer flowers, picking vases in a variety of sizes/shapes is a great option. Doing so also adds depth and height to your table. For our buffet table, we added two arrangements by Nearly Natural. Can you believe those peonies below aren’t real? They are so beautiful and a wonderful option of you’re wanting to reuse your blooms or have someone attending with terrible allergies! 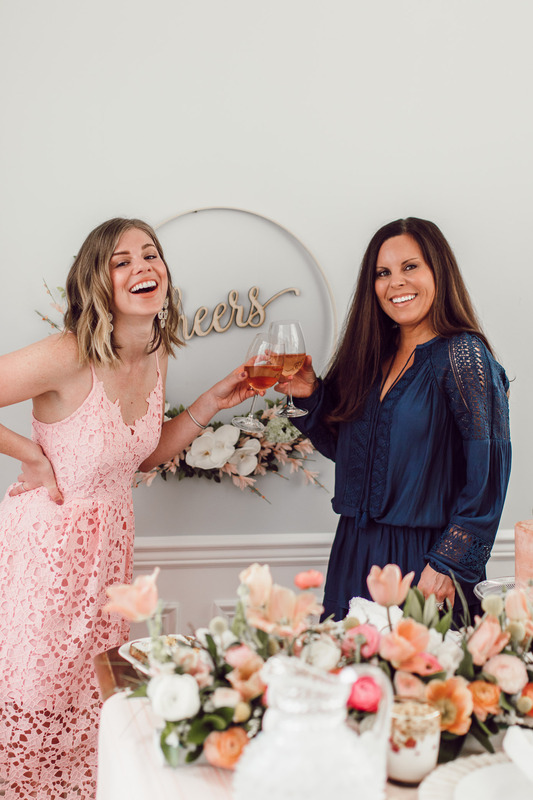 Yes, I am calling the rosé a decor item. 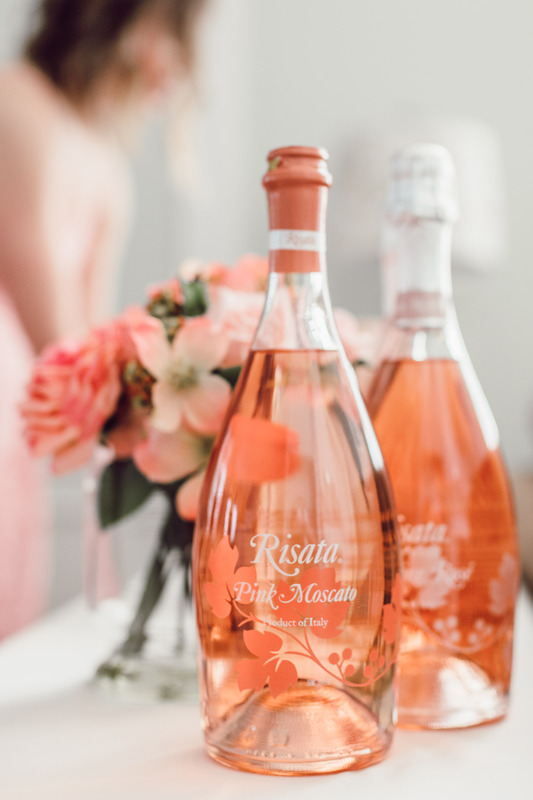 With bottles as pretty as Risata’s Sparkling Rosé they deserve to be displayed! We placed one on the table for enjoying and a couple on the buffet as decor…and also for enjoying! 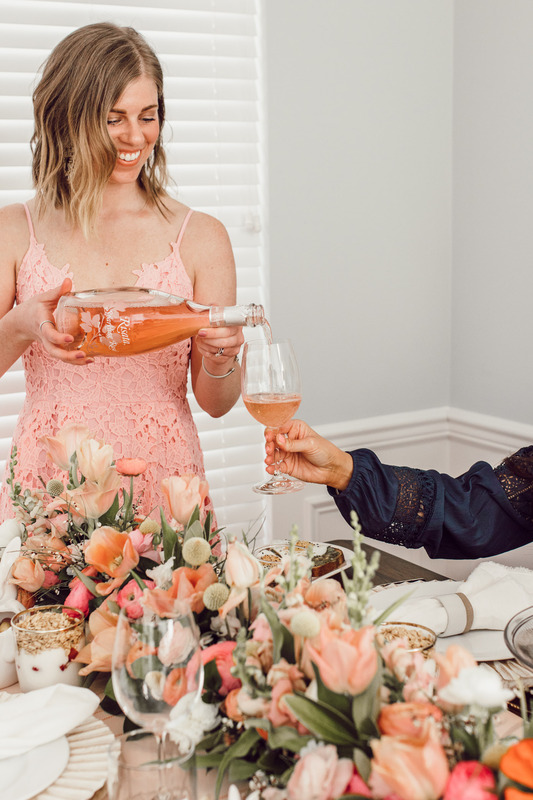 I highly recommend serving Risata’s Sparkling Rosé at your next spring soiree! This sparkling rosé is crisp with aromas of strawberry, raspberry and delicate floral notes. Very light! Perfect for both the spring and summer seasons. And again, works great as decor as well! Let me start this off by saying that brunch is my absolute favorite meal/occasion. Yes, I feel as though brunch isn’t just a meal but an occasion. Brunch typically lasts hours and contains many indulgent dishes (hence why I love it). 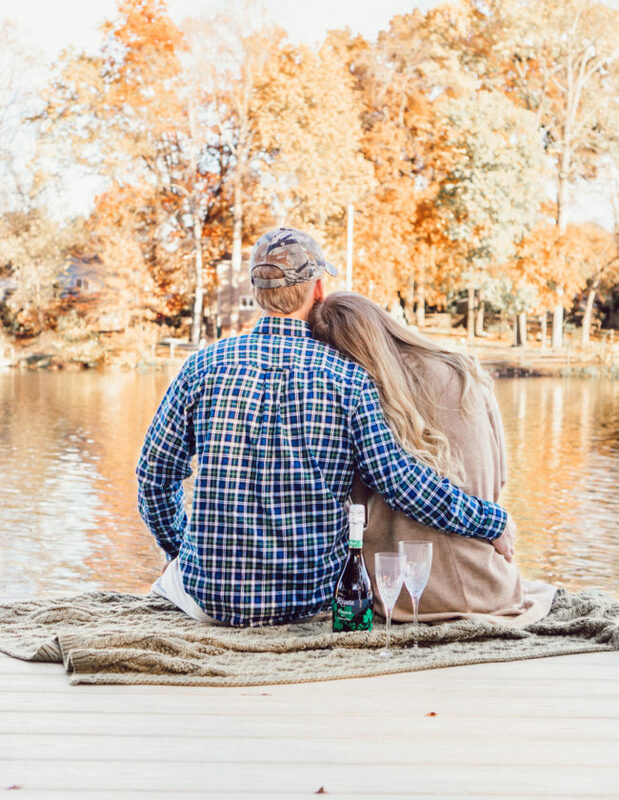 It also typically involves something bubbly and long conversations and loud laughs with friends + family. Therefore, the menu is important and requires a little planning. A couple of items you always want to include: fresh fruit, biscuits or croissants, protein (eggs, sausage, bacon), and sweets because it is after all an indulgent meal. Sweets are most important when brunch is around a holiday as well. Even more reason to celebrate and dive into your favorite treats! Also, don’t forget the bubbly. Whether that is prosecco, champagne, or rosé. We opted for rosé as spring is the start of rosé season. The loveliest drink to sip on when the sun is shining! Need to take one moment to talk about this beautiful cake created by Bridgette of Craft Cakes CLT. 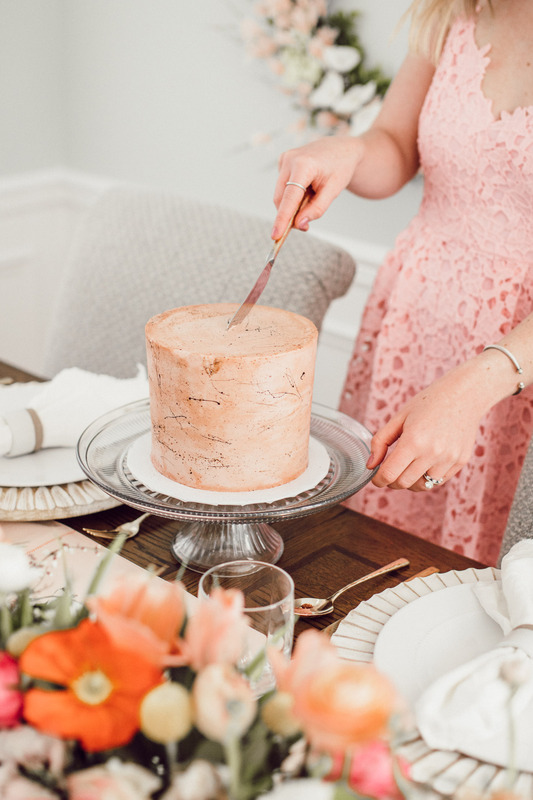 Our design inspiration was those speckled Easter egg candies and we of course opted for the pink hue. Bridgette nailed it and created not only a beautiful cake that seriously added to our decor but also the yummiest cake ever! Seriously, it was the most delicious treat to end our meal with. And if you’re wondering, I had two slices post meal. 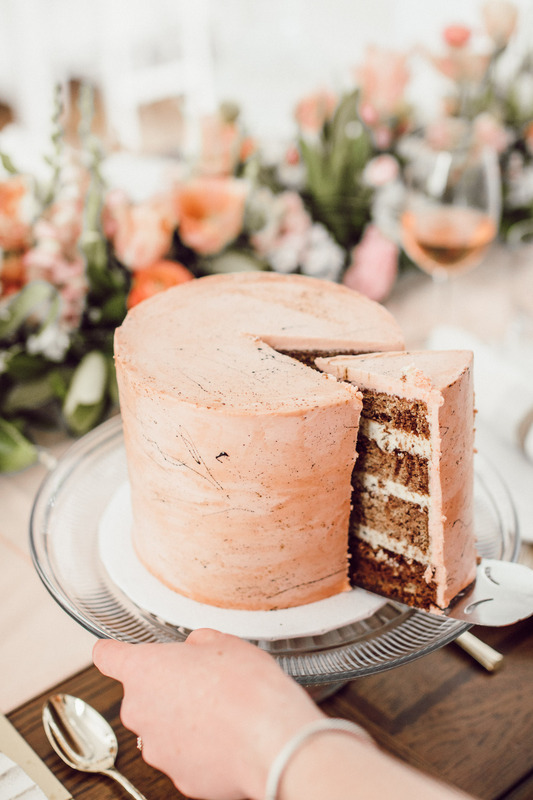 If you’re in the Charlotte area I highly recommend Bridgette for events, weddings, birthdays, anything that requires a cake! 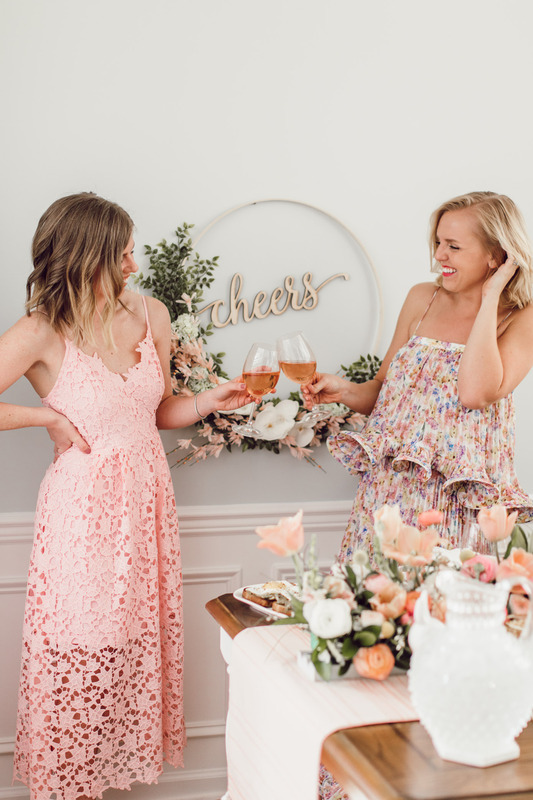 Being bloggers, we wanted to create a cute backdrop to snap some photos. Kind of like a photo booth, just a little more simple. And let’s be honest, we’re all about capturing the cutest snaps to share on our instagrams whether we’re bloggers or not. It’s fun to be silly (or cute if you’re into that haha) with your girl friends and snap some photos together. So creating a little backdrop for you do so is a must! Taylor created this beautiful floral hoop arrangement after we spotted one on Pinterest and decided we needed one. Her creation was definitely not a Pinterest fail!! Creating one of these floral hoop arrangements is perfect for the spring season. Aka more flowers are always a good idea for spring! If you want real flowers you can contact a local floral shop and I am sure they’d be happy to create one for you. And of course, have a glass of Risata’s Sparkling Rosé in hand! Us gals love any and every excuse to dress up. Therefore, for this brunch we decided to go all out in our best spring attire. Which meant bright hues, lace, embroidery, and floral print. As always, I opted for a more feminine number. 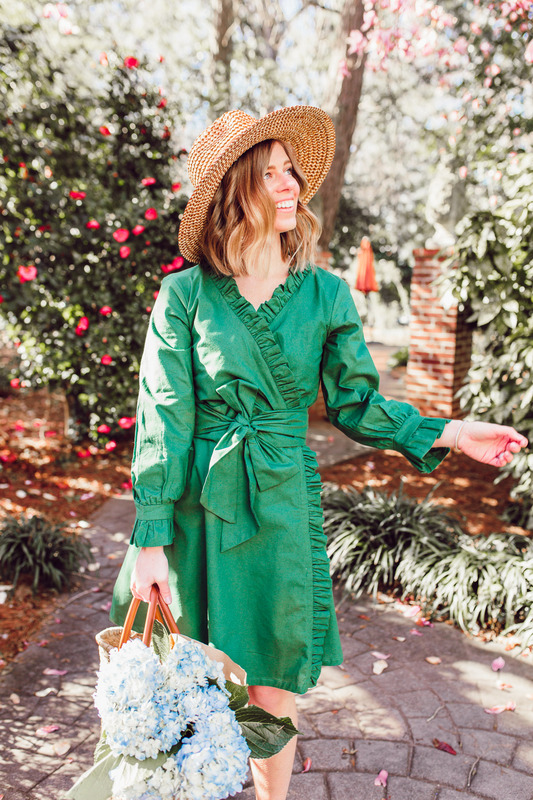 If you follow a couple bloggers via Instagram or their sites, chances are you have seen this dress once or twice. At first, I did not get what all the excitement was about but upon trying it on, I understood. First, let me say, it does run small. You have to size up two full sizes. Which isn’t the most fun but hey, can’t get along with every brand sizer, right? However, once you find the right size, the dress fits like a glove. Nips at all the right places and provides space where needed. The dress is so comfortable I ended up wearing it all day long and if my knee had been up for it, I would have grabbed Joshua’s hand and headed somewhere to go dancing! If pink isn’t your hue, don’t fret, floral lace midi dress comes in seven other colors. 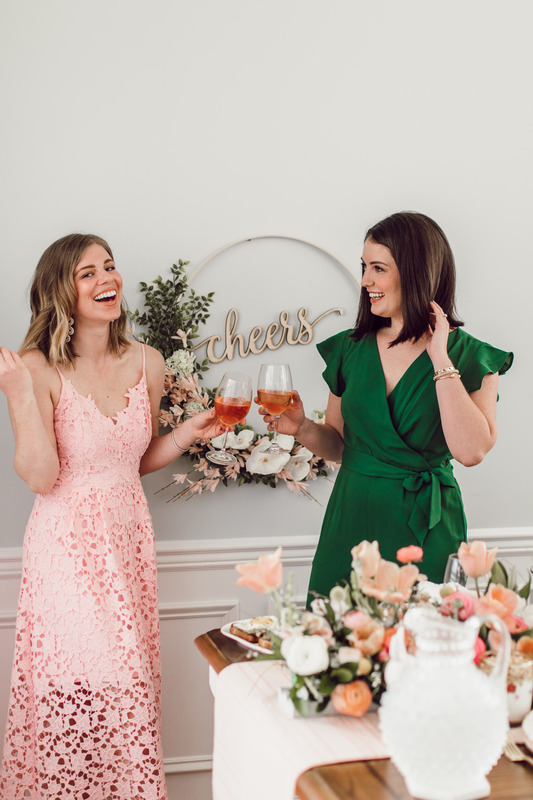 If you’re throwing your own spring brunch or attending one, I would reach for your favorite floral dress or prettiest pastel. 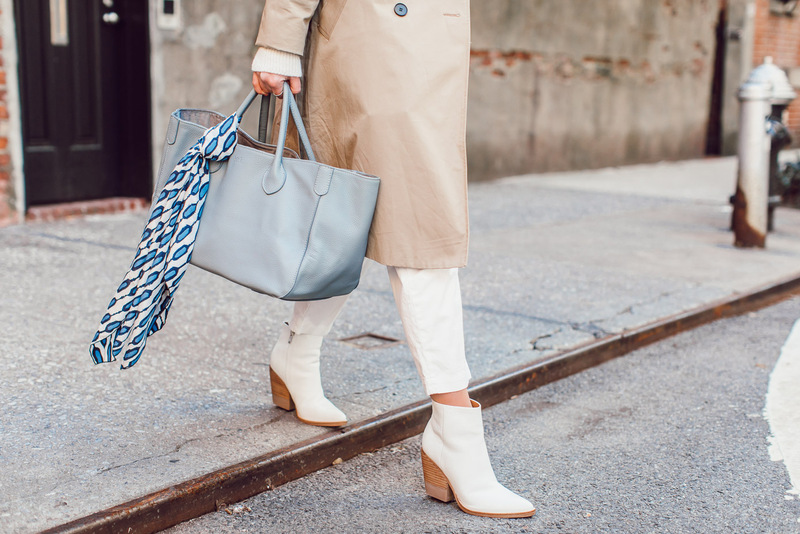 Occasions like these are when you can go full on feminine with all the spring vibes! Thank you to Risata Wines for sponsoring this post. All view and opinions are of course my own. 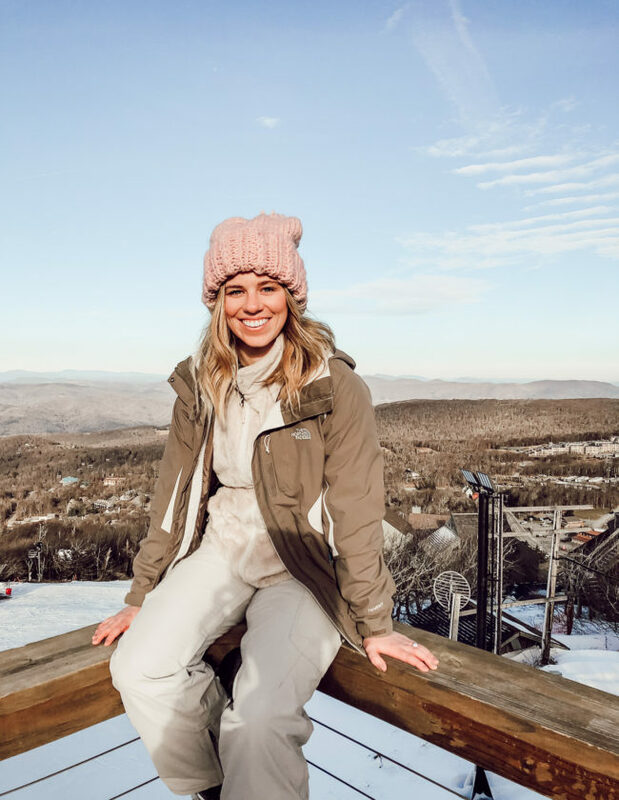 Thank you for supporting the brands that make Louella Reese happen! This looks like so much fun- what a great menu! 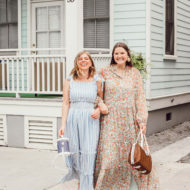 I have the same dress as you and am excited to wear it to a wedding this summer! It really was! And thank you gal 🙂 everything was so yummy! Aw fun – enjoy the wedding! I could not agree with you more! Yayyy!! Oh what a gorgeous set up! Wow! 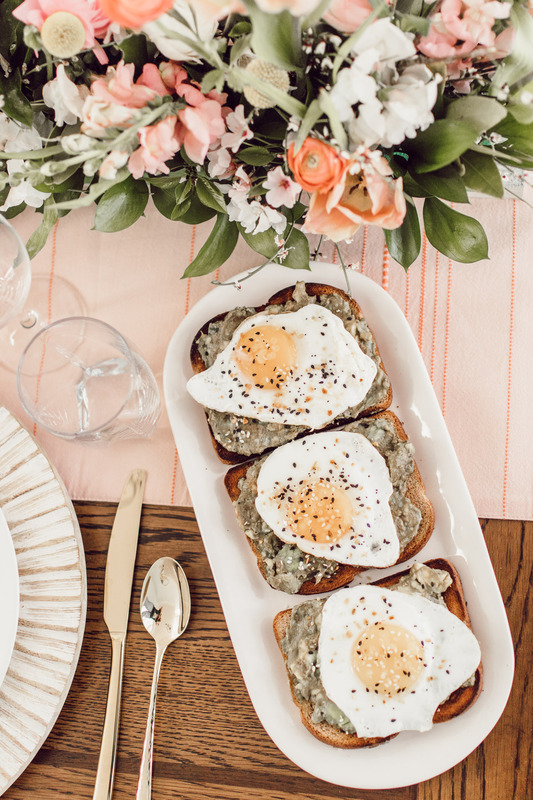 This entire brunch looks absolutely gorgeous — from your outfit down to the floral arrangements. I totally wish I was there with ya’ll to celebrate Spring! I also own this ASTR The Label dress in the rose color and wore it recently to an event — I receievd a lot of wonderful compliments on it and I think you pull it off so nicely with your figure. Thank you so much Amanda! I really appreciate it gal 🙂 Aw yay – dress twins! It is such a fabulous dress – I now understand what I’ll the excitement around it was about! Take me back, especially for another slice of cake! I am literally craving it after seeing the pics again! Simply can’t wait to do this again! Right? Me too! That cake was literally everything! This is the most beautiful tablescape I’ve ever seen! It would be so perfect for Easter, bridal or baby shower, or birthday!! 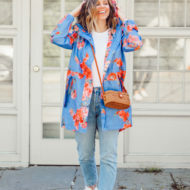 I love how creative this was as a collab between bloggers, looks like so much fun! This looks like so much fun! The food looks really delicious and I love a good rose!! It really was! Oh you need to try Risata’s Sparkling Rosé it is wonderful! 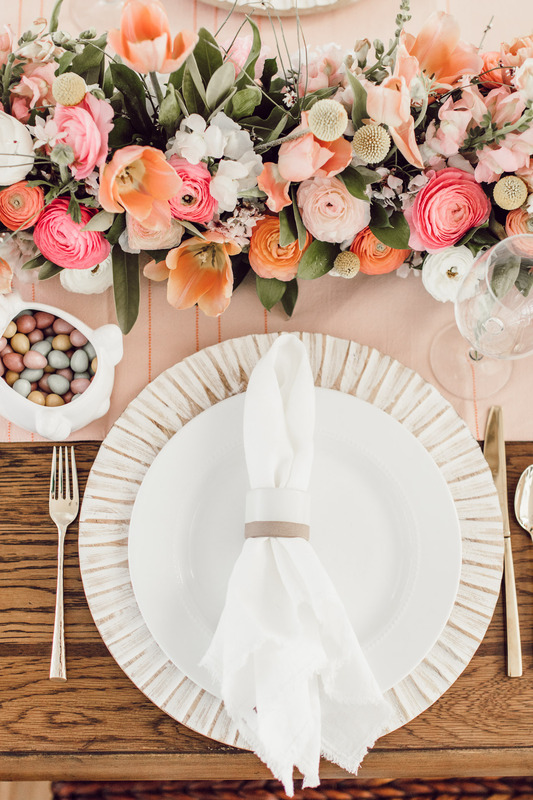 I mean this is so Spring chic, the color palette is absolute perfection & the table decor is amazing. 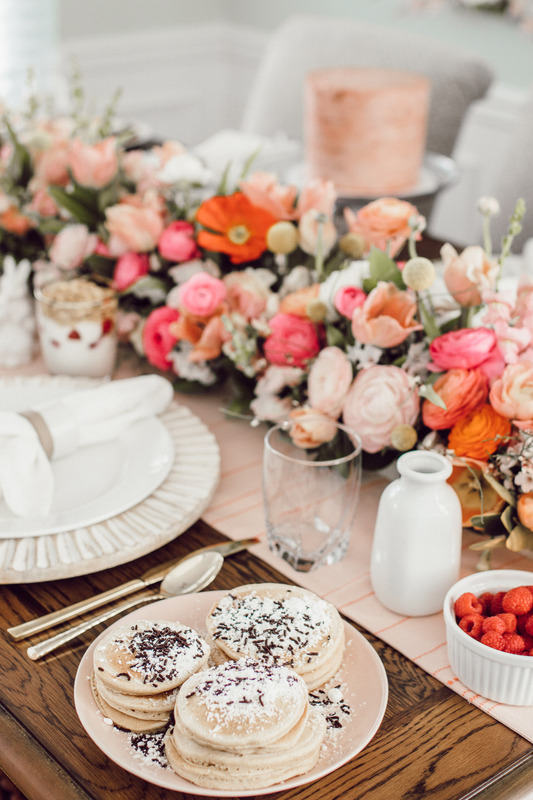 What a gorgeous table and brunch set up! I’m so happy for rosé season– although lets be honest, I ‘ll drink it all year! Beautiful post! Thank you Amanda! Haha I am with you gal 😉 I do think it tastes better on a warm/hot day though! Thank you so much Jamaria! Yay 🙂 I am so happy to hear that! This all looks so amazing. I would love to have something like this with my friends. Thank you! You’ll have to plan one! I love that dress! It’s so pretty, and I love the color. The table and menu look so amazing! Brunch is definitely an occasion, and it’s so much fun to enjoy good food and drinks with friends. Thank you Laura 🙂 so glad you agree it is an occasion – and a fun one to celebrate! These photos are so cute & that set up looks amazing! You’re the sweetest! Thank you Tanvi 🙂 and yes of course!!! This is the cutest brunch!! The flowers are gorgeous and I’m loving the decor and outfits. So inspiring! Thank you so much Darleen! It all came together so well!